Re-rolling mills in SME sector play a very important role towards the steel economy of the country. There are around 1800 re-rolling mills in small and medium enterprise (SME) sector in India. The rolling capacities of these mills are mostly in the range of 8,000 tons per year to 80,000 tons per year. These mills are crucial to the national economy since they are not only making available a large amount of finished steel in the market but many of these mills are also converting a substantial amount of steel scrap into finished steel thus serving the overall cause of steel recycling. Since the conversion of steel scrap is taking place without its melting in these re-rolling mills, it is helping towards the cause of the conservation of raw materials and energy as well as saving the generation of green-house gases. The technology adoption level of these mills is rather low and many of these mills operate with technologies which are 50 years to 60 years old. Most of these re-rolling mills do not have practices to keep systematic data in different areas of their functioning. These mills operate at low level of productivities and high level of energy consumptions. They have some special problems and challenges. Re-rolling mills in SME sector practically do not have even simple control systems. They work with a low degree of standardization. The work force is having high experience in limited area. There is increased focus on the experience of the people and there is practically no effort to enhance the knowledge of the work force. The approach to all the issues is informal leading to decisions which does not often bring improvements in the working of the mills. Re-rolling mills in SME sector have traditionally relied more on local markets and they are currently less- equipped to face market challenges of a highly competitive environment. For facing this challenge, the mills are required to incorporate innovation within their workforce, processes, and products. This needs in a massive scale upgradation of technologies presently employed. 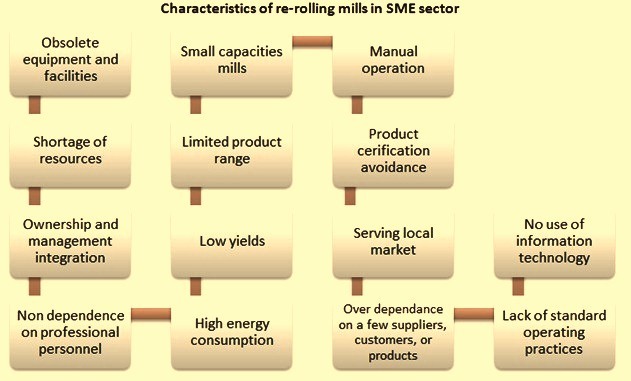 The characteristics of re-rolling mills in SME sector (Fig 1) include (i) obsolete equipment and facilities, (ii) shortage of resources for improving performance, (iii) integration of ownership and management, (iv) non dependence on professional personnel for solutions, (v) small capacity mills, (vi) limited product range, (vii) low yields, (viii) high energy consumption, (ix) mostly manual operation, (x) avoidance of product certification, (xi) serving mostly local market, (xii) over dependence on a few suppliers, customers or products, (xiii) lack of standard operating practices, and (xiv) practically no use of information technology etc. These mills have been set up by those entrepreneurs who rarely had formal technical education. The employees of the re-rolling mills are again mostly those workers who rarely had formal technical education or training. These workers have learnt and gained knowledge by working under their senior experienced workers. The re-rolling mills in SME sectors are being operated as owner based organizations. The organization does not have an elaborate management structure. In these organizations, the owner either himself or along with his family members is the overall in-charge of the mill. He performs multi-tasks functions and is the only decision maker in the organization. The owner normally has good experience of running the type of rolling mill which he has installed but he has very limited knowledge of the technology development which is taking place around the world in his area of operations. The information base used by the owner for decision making is mostly local and narrow. The main sources for his information are customers, suppliers, and local competitors through market intelligence. In most of the cases use of information technology is limited for remaining up-to-date. Since he is carrying out several functions of the organization himself, he is under time constraint most of the times as well continuously under a lot of stress. Shortage of financial resources is a common problem of rerolling mills in the SME sectors. The owners have difficulties with finances since they invest their personal savings and assets and the funds borrowed from family and friends into the mill. This is one of the prime reasons for the technological backwardness of the re-rolling mills in SME sector since the owner who has already stretched himself during the setting of the mill does not has enough resources left with him for technology upgradation. The re-rolling mills are in a state of conflict. On one side the owner realizes that to survive he needs upgradation while on the other side there is stiff resistance to upgradation. The mills are not being technologically upgraded mainly because of two reasons namely (i) lack of resources with the owner, and (ii) resistance from the workforce, since they are having fears that the value of their experience reduces drastically when the upgradation of the technology is put into operation. Since the technology employed in the mills is not getting upgraded, the mills are moving fast to a state when the owner will realize that to keep the mill running is no more economically feasible for him. As the re-rolling mills play a very important role in the steel economy of the country, it is very important for the authorities to see that this sector moves forward towards a healthy growth. Since the path is full of difficulties, it is necessary to find ways by taking into confidence all the stakeholders so that the required technological upgradation of the re-rolling mills of the SME sector take place. The re-rolling mill sector also needs service support for the improvement of their operations and management. The support is needed for the improvements in the areas of upgradation of knowledge and competence improvements. This type of support is not capital intensive and can be obtained with a little expenditure. This type of support can be provided through such services such as consulting, mentoring, training, workshops, and seminars in various educational fields (e.g. regulatory requirements of operations, change in management practices and the organization of work, improvements in the working conditions and skills of the workers, knowledge enhancement, analyzing of data for decision making, methods employed for improvements, change management, and encouragement for innovation etc.). The service support is to be tailored to address the problems faced by the re-rolling mills and must limit to those low cost solutions which the owners are in a position to invest. An attitudinal change is also needed in the approach of the owners for re-rolling mills to achieve success in the quest for improvements. This attitudinal change in the owner’s thinking is to include orientation to goals setting, commitment to those goals and persistence for their achievement, constantly decision making, calculated risk, acceptance of responsibility, and innovativeness etc. The characteristics of the management practices which the owner of a re-rolling mill in the SME sector is supposed to follow include the following. Ability to take initiative – The owner is a person who identifies an opportunity, trying to extract the best outcome from it. He is to have ability to take initiative so that his mill continues to remain on the path of progress. Self-confidence – The owner is to have self-confidence. He is also to believe in his abilities to take timely decisions for the (i) growth, (ii) process improvements, (iii) technological upgradation, (iv) improvement in the working environment, (v) product quality enhancements, (vi) cost controls, and (vii) knowledge enhancement of the workforce. Possession of leadership quality – The owner needs to have the leadership quality so that he is able to influence the behaviour of his workforce. The workforce with the right behaviour helps in achieving the objectives of the organization and contributes actively towards the success of the organizational performance. Ability to assume the risk – The owner needs to have the ability to analyze the opportunities and to know the risks involved before taking a decision. Taking of calculated risks along with acting with innovativeness bring success to the organization. Originality – The owner needs to have originality in his thinking as well as in his approach for finding solutions to the problems. For this it is necessary that he remains updated with the information regarding what is happening around the world in his area of activities. He gets several advantages if he takes a decision ahead of his competitors. The ability to predict- The owner is required to watch the trends of different activities in a continual way. This helps him in predicting what is in store for him in near future. This helps him in planning for the future and since he has taken preventive actions well in advance, he is least affected in case of the future unhelpful events. Creativity- Creativity is another characteristic which the owner needs to have. He must be able to generate new ideas and designs so that his mill becomes an example for others to follow. Creativity can be in the form of improved operating practices, new products, reduction of waste generation, recycling and reuse of wastes, increased yields and improved energy consumption etc. The inner drive to succeed – The success comes only if the owner has an inner drive to succeed. For achieving success, he must set big goals in front of him which are achievable. He is tend to behave very ambitious and has to remove obstacles in the path to achieve success. Dynamics – The owner is to understand the dynamics of PEST (political, economic, social and technological) factors which are though external to his activities have major effects on the performance of the mill. For continue to be successful, he is to regularly carry out the analysis of the PEST factors and take timely actions to counter the adverse impacts of these factors if there are any on the operations of his re-rolling mill. High motivation – The owner is to be highly motivated for achieving high standards in the mill and for meeting the objectives of the organization. Only a motivated owner can motivate his workforce. Acceptance of constructive criticism – A good owner must know how to receive criticism. The obstacles coming in the way of achieving success is to be treated as normal. All criticisms and obstacles are to be analyzed objectively for taking decisions on the corrective measures. Good interpersonal relations – The owner needs good interpersonal relationships with the customers, suppliers, regulatory authorities and other stake holders. It helps in having satisfied customers, smooth supplies of materials, smooth working with the regulatory authorities. Good relationships help is receiving good support from the external agencies which is a key to success of the organization. Appropriate strategic planning – The owner who carries out short-term/medium-term planning as well as operational planning is able to capture most of the opportunities which are available to him for the success of the organization. Key success factors – It is necessary that the mill owner in consultation with the experts determines the critical success factors for his mill. After determination of the critical success factors, he must carry out the planning to achieve and maintain them. There are normally available two paths for improvement. One path leads to massive improvements in one go. Adoption of this path needs heavy investments. The other path is to adopt short term incremental improvements. This path needs low investments and takes the organization on the path of continual improvements. The owner is to take a decision which path he wants to adopt for the improvements in the performance of the mill. Stress is a normal companion, a certain feature of the organizational life and is largely associated with the execution of duties and tasks at work, daily routine, relationships with other people, control and performance of the management processes, as well as a variety of unplanned and unforeseen circumstances which the owner faces with, during his daily work. While for the entire workforce of the re-rolling mill has a normal, natural, level of stress, the owner’s situation is slightly different. He is under increasing pressure not only for the short-term problems, but also for the long-term planning, financial issues, and issues related to input materials and marketing of the product. He is more prone to experiencing different problems because of the position and level of responsibility demands that are expected of him to meet. In order to create a healthy and motivating work environment, the owner is the one who needs to develop leadership skills and autonomy of thinking of other employees. The practice of ‘self-leadership’ is the development of personal motivation and desire for achievement of organizational goals, but in a way this also helps in reducing the stress and in increasing the job satisfaction or easier coping with problems. The owner of the re-rolling mill needs to have the following ten dimensions of the managerial skills as given in Tab 1.